I didn’t use a pattern but there are many variations available on Ravelry. The next sweater is a garment I’m absolutely thrilled with. I knit Amy Christoffer’s Acer Cardigan in Bittersweet, a rich brown that looks just like dark chocolate! I shortened the sleeves and fussed a bit with the finishing–I changed the button band to a sewn-on button band, used a one-row buttonhole (WHICH ROCKS) and changed my mind twice about the buttons themselves. I started with minty green vintage plastic, thinking of mint chocolate chip ice cream the whole time. After ignoring the sweater for a few days I realized I’d be much happier with a more covert, sorta steampunk button, a thin bronzey number. I experimented with using a different color thread for each one, but then I just switched to tomato red on all of them (the rainbow gradient was looking a bit grade school). And now, it’s perfect. The yarn is so so soft, and because it has no wool in it, I was able to wear it all day in August! It has a lovely worn-in t-shirt feel, and a soft tweedy look. NOTE: Contest is now closed. Comments are closed. A winner will be posted later today, and comments reopened. Have you read this far? I’d love to repay the kindness by offering one Acer Cardigan sweater kit (1 pattern + Remix to knit it) to one randomly chosen commenter! Please comment below with your thoughts on the trend of greening your knitting. Have you tried any “green” yarns? Have you recycled any old sweaters? I’d love to hear about it. I love that cardigan! Great work. In the past I’ve used a recycled cotton yarn. It was surprisingly pleasant to use and I liked the fact that it was greener than other choices. I like to think that by choosing to knit, we are cutting out a middleman in clothing production, but getting greener materials to work with makes the choice that much easier and better. I have recycled old sweaters, but to be honest, for me, it was so much work and took so much time for a yarn that ultimately wasn’t very pleasant to work with that I didn’t find it to be an option I will be choosing very often. One of my favorite yarn-recycling pastimes is buying sweaters at garage sales that are either ill-fitting or ugly or damaged in some way, unraveling them and reusing the yarn. I’ve made some great finds of high-quality fibers that have only cost me $1 or so and a bit of time in the end! I love the idea of reusing what’s already been produced. I’m interested to see how the dyelots work out, if they’re using only previously dyed materials to add color will I be able to get another similar skein if I run out of yarn for a project? I haven’t tried any green yarns because they seem to be more expensive than regular yarn. But if I find a pattern I like in a green yarn I will buy it. I think it is a great concept, especially if we can move away from arcylics. Your cardigan is really beautiful and might be my next project. Acer is such a lovely cardigan–and you did such a great job! I have definitely ripped apart and knit from recycled yarn from old sweaters and I’ve used used thrift store yarn, but I tend to be a bit skeptical about “enviro-friendly” yarns. Is it really more environmentally friendly to use bamboo when it takes so much energy to process the fiber? I really like the idea of Remix using leftover fibers, since it truly is reusing something that would otherwise be thrown away. I think that it’s a great idea to provide more green / sustainable yarns. This Remix yarn sounds like it’ll be hit. I can’t wait to check it out myself. I like the idea of using up knit fabric scraps to make this new yarn. There is no need to waste good yarn. I personally haven’t used any ‘green’ yarns yet but I remember helping my mom unwind old sweaters when I was a kid. Wow, I’d sure love to win this. While I haven’t used any “green” yarns yet, I was drooling over the Remix yarn at our new LYS here in Washington DC, Looped. And that’s a beautiful pattern! Does it have waist shaping? I read the description of how Remix is made, and I like the idea a lot. Reminds me of the recycled sari silk yarn I have in my stash. The sweater looks like it would be an instant hit with my wife, and I could finally get beyond hats and mittens into making an actual garment! I haven’t tried any ‘green’ yarns yet. For the past couple of months, I’ve been learning how to spin and enjoying working with combed and carded wool fibers. I love the rustic look of my handspun yarns but also miss the more predictable, smoother look of commercial yarns. I’ve also come to realize that spinning enough consistent yarn to make a sweater is not in my immediate future. Would love to win some Remix yarn! I love the way it looks and the fact that it would work well in my climate (SF Bay Area). I have yet to try a green yarn… I have been intrigued by the Remix yarn though and plan to try it out when I have used up my current stash. I think there’s definitely room in the industry to carve out a nice “green” niche for yarns, needles, etc. I love your button choice (and the red thread) on your grey sweater, perfect finishing detail! Cute sweater too, it’s a pattern I’d overlooked. I’m already a big fan of Berroco yarns, so I’m happy to see them coming out with green options. I used to recycle a lot of yarns from old sweaters before I worked in yarn shops and ended up with a rather large stash. Now I’m trying to knit from the stash, which occasionally results in recycling knitting from a previous season that didn’t work out the way I’d planned. Ironically the last two recycles were Berroco yarns that had been knit into garments I wasn’t in love with and so I took them apart, re-skeined the yarn and started again. I managed to turn some Berroco Peruvia into a lovely cabled sweater coat (sewing it together now), and some Berroco Seduce that was knit into a tank top a couple of seasons ago was frogged and is now a cute short-sleeved top that I’ll wear a lot more. I know this is a LONG post, but I thought I’d mention that buttons are a great way to recycle (I cut the buttons off anything that’s not worth donating to charity as a wearable garment). I string the buttons together on a piece of string so that they stay together, and my button stash is the first stop when I’m looking to freshen up an older garment or find buttons for something new I’ve just knit or sewn. Remix looks like an interesting yarn, and I’ll definitely keep my eyes open for it at my LYS. And thanks for the contest, lovely idea! I haven’t tried many “green” yarns yet because many of them have an odd texture. I’d love to win some yarn and test it out! Ooh. That’s lovely yarn. Hope a vendor around here gets some in! The sweater looks awesome – I would love my own! I think these newer green yarns are really interesting…looking forward to seeing them at my LYS. I have not tried any of the ecologically minded yarns yet but would love the opportunity to win the Remix and pattern. Thanks for offering. I’m using Remix right now for the Salem hooded jacket from New England Knits, and I love it! Just the right kind of comfy yarn for a hang-out hoodie for the warmer Southern California weather. I don’t have the patience for recycling yarn from sweaters, but I try and use yarn made from reused fibers when I can. I like the thought of using something that would have been considered trash and making something useful and beautiful from it. I have not tried “green” yarns, meaning the products I’ve seen in stores with eco- prefixed names and a percentage of recycled content. I have used a lot of yarn which I have reclaimed from old sweaters and that has been fun, deconstructing sweaters is a sort of vicarious knitting. I think the best way choose sustainablility and low or positive environmental impact with my knitting hobby will be to use local, organic grown, handspun yarns. I love the ‘green’ yarn movement, and especially the fact that y’all aren’t re-dyeing your Remix. I love vibrant deep colors, as do many others, so this is another way to achieve those without using additional acid dyes & more water. I don’t think we’ll ever completely move away from dye methods that use both of those, but being more aware of our impact and finding ways to minimize it where we can is always a good thing. I LOVE LOVE this sweater!!! I most definietly have to make this!! Thanks for taking pics of it! Ok, fingers were a little fast! I’ve only tried one “green” yarn, unless you count bamboo yarn…yarn made from recycled saris. I loved how colorful it was, but heaven help you if you had to frog it…it wasn’t very sturdy. I LOVE any yarn with bamboo in it (that’s kinda green because bamboo is a very renewable resource)! The cardigan is beautiful! This sweater is beautiful – I love the styling! I haven’t used any “green” yarns, though I have played with some natural dying, and I adore the colors that can be attained. I love how they can be so rich and muted all at the same time. I haven’t tried any “green” yarns yet but I would be willing to consider them if they feel soft and wearable. I love that cardigan — I’ve got it in my queue! Kudos to Berroco for coming up with Remix — I’ve only good things about it. I confess, other than using mostly natural fibers, I don’t consciously seek out “green” yarns. Most of them seem to be organic cottons, which I don’t really enjoy knitting with. I have not really “greened” my knitting really… but I do try to order yarn in large amounts so it can all ship in one box, rather than buy a couple skeins every few weeks that have to ship on their own. It is nice to see that there are green yarn options popping up everywhere! Lovely cardigan! I would definitely try this yarn–it sounds interesting and I like the green idea. I haven’t tried too many “green” yarns yet, but I have unraveled sweaters and reused the yarn. I wrote a long post about “knitting green” a few years ago. Despite having thought of it, I haven’t really gotten any better with regards to mad consumption (including of cashmere products), though I haven’t swapped or ordered anything from overseas for a while. The greenest thing I’m really doing at the moment is trying to use what I have! I’m also trying to ensure that I get more locally produced yarns, which is quite difficult in Ireland. I haven’t tried any ‘green’ yarns, but am interested to give it a try. I love the sweater! it looks so cozy. I love the cardigan. And the Remix yarn. I love the fact that we can also go green with our knitting and do our part to minimize our footprints. I absolutely love the cardigan and the cap. But the cardi would be perfect for those cold AC offices and drafty places come this fall. I love the colour you chose! My only “green” activity is to recycle yarn from older garments, but I like the idea of a real recycled fibre. I have not used any green yarns, nor have I spent more than a few minutes reading about green options and what makes a yarn green. I feel like any difference that could be made in environmental impact is tiny compared to other choices we make every day. I’ve bought thrift store sweaters that I’ve unraveled and reknit, but not for ages. That cardigan is lovely! The recycled yarns I’ve come across thus far have been fairly low quality, but I’ve been hearing really good things about Remix. I’d love to try it, and I’ve had my eye on this cardigan for some time! I’ve not tried any green yarns yet. I’ve seen a couple but not bought any. Haven’t tried any ‘green’ yarns as of yet, but I do love to buy yarn when I know where it comes from (i.e., local). That cardigan is really nice – and I love the “Bella” hat too. I’m a sucker for Twilight stuff, even though I’m almost 30! I love the Acer cardigan and making one with a non-wool yarn for warmer months is such a great idea. I’m so happy to see another great ecological yarn on the market. It’s important to consider where our yarn comes from and how its made, just as we do the food we eat, the clothes we wear, and the products in our home. I hope that this isn’t just a “trend” in knitting, because it’s an important part of the handmade culture. way to go Remix! I adore Remix. I’ve got a slouchy tee made in the Strawberry color, and have had to reclaim it from my teenager’s dresser a couple of times already. I may need to knit another one. I can’t wear wool, and find that mostly-acrylic sweaters are too warm, but I’m thinking that a Remix cardi will be my next project. I’ve used recycled cotton (K1C2’s Second Time) before, and really like it, but it’s not drapey or soft enough to make a snuggl-y cardi. Recycling an old sweater is one of my favorite green practices! Nothing like taking something you don’t like and turning it into something you love! What a great basic! Would love to try out the new yarn. I’ve used some organic yarns with mixed opinions. The feel of knitting the yarn didn’t fit my expectations. Having a soft yarn that’s spin right for the fiber content and matches your project needs are still the most important factors. But, I still wish more of the yarns I love could be organic or local and I’m excited to try Remix! The sweater looks great. I have never recyled a sweater. I would read about people finding great ones at a thrift store and recycling the yarn but haven’t come across anything worthy. It may be because a girl at work always finds these great wool sweaters at Goodwill and may fix a rip and then wears them all the time making alll of us co-workers jealous. Ooh! Love the textured stitches, and the yarn sounds wonderfullly soft. It’s great to have a new recycled yarn option. Great sweater! I’ve heard good things about this yarn, and I’d love to try it. In knitting, like in life — in everything — we should we conscious of waste, reuse, etc. I’ve recycled countless sweaters for the yarn. As far as “green” yarns, I’m not sure, but I suppose the answer is yes. i love “greening” by only purchasing yarn that i LOVELOVELOVE, and mending my creations until they’re absolutely threadbare. I haven’t gotten “green” with my yarn yet, I keep meaning to hunt my locaI l thrift stores for sweaters. I read the description of how Remix is made and I think it sounds like a great idea, can’t wait to try it out. I’ve used tencel, soy, and bamboo – of these tencel is probably the most green. Dye with natural dyes. Well depending on your definition, wool from the sheep may be considered green or brown, grey, black, or white … and I’ve spun that as well. Love the red thread! I’ve used t-shirts to make yarn and have a cushion on the needles. I’ve used recycled cotton for a super-simple baby blanket…babies and cotton go together. And I’ve bartered for a ribbon-type yarn sweater with a big hole in it. I pulled it apart and will soon have a “expensive-looking” scarf to wear during our not-so-cold Florida winters. Would love to win this kit! I have taken a on sale knitted tank top from LL Bean and re-used the yarn. It is a pretty pink silk blend. It ended up costing me less than if I were to purchase the yarn new! Love it!! Like I need more yarn…but it’s awesome yarn! I have not made anything with green yarn yet but there are some that I am interested in trying. I’ve been eyeing both the pattern and the yarn — I also love the patterns in the Remix book. I’d love to try it! I, too, have tried the recycled yarn from old sweaters routine. With mixed results. I do like the idea of this yarn, and am glad to hear that it is nice to work with – and to wear. I’ll be looking for it! Always up for brown I am! It’s not around every year somi try to buy clothes when the color is in fashion. This is a beautiful sweater. I love the red for the buttons. Such a subtle pop! I like to buy wool sweaters from secondhand shops and felt them. You can make some really great purses that way. I love the sleeve length on the cardigan. I’m intrigued by Remix, and I look forward to trying it out sometime. Love that sweater! I haven’t tried any “green” yarns but I’ve also been stuck knitting pretty much from stash due to financial constraints. I’m just thankful at this point that I was forward thinking enough to create a stash. So happy to see a yarn like this from you guys! I have used o-wool in the past, and I loved it. Anything organic, green, or Eco-friendly is an A yarn in my book. I try to knit with these types of yarns a lot. The closest I’ve come to a truly “recycled” yarn is some recycled sari yarn, whose actual level of greenness is a bit doubtful (aren’t there better things to do with old saris…?). I have also been trying to buy local fleece for spinning lately–perhaps taking things to an extreme–but there again, there seem to be complexities to the greenness… Water usage? cleansing products, ground water…? Where *does* all that lanolin go…? Maybe the best I can say is that my intentions are good! I love the tweedy colors of Remix and the fiber mix sounds very appealing–hope to have a chance to try it sometime. Your sweater looks great. Ahhh, another sweater to the queue! Hmmm, green yarns… I have never purchased recycled yarn before except for the sari yarn from Nepal. I have some organic cotton yarn and some yarns from small local farms that were processed at the Green Mountain Spinnery. I have an old yak’s wool sweater that I have been unraveling slowly to make into something else and have a crate of old wool sweaters that are ill fitting that I am saving to unravel or repurpose someday. Thanks for the inspiration and for the give away. I will definitely be trying some Remix, one of my all time favorite yarns (sadly not made anymore) is Evergreen from Classic Elite, which was made from recycled yarn. It made for an exquisite tweed fabric and showed cables perfectly, since it was a thinner yarn. Sigh, I miss that yarn, so if Remix is anywhere close to Evergreen, I will be a very happy camper. Thanks for revitalizing Berocco yarns and offering natural fibers and luxury mixes at still affordable prices, I’ve noticed! As for recycling, I’m old enough, (and pack-ratty enough) to be able to reach into the back of my closet for the sweaters my mother made for me when I was age 15 to 25. Her knitting was classic/timeless in design and much of it still looks crisp today. In fact, her ‘fisherman-knit’ sweaters were made from wool sold by the pound out of a box (in the door and on the left?) at Stanley Woolen Mills, your company’s predecessor. These sweaters also wear like iron and are the go-to sweater for snow shoveling, cross country skiing – any heavy outdoor winter workout. I always wondered if that wool came from local sheep. It had a high lanolin content. Then there’s the cape I sewed when I was 15 as my entry for the Make-It-Yourself-With-Wool contest from a Stanley Woolen fabric. I made it out of a heavy block plaid in white and brick and brown and the fabric is as beautiful today as it was lo these many years ago. In the spirit of reuse, (and since the Sartorialist was just talking capes today), I think I’ll pull that one out of its hiding place and debut it anew this fall. Also, there’s the recycling that gets done between my own closet, my mom’s closet and my daughter’s closet. But that’s a whole other story. Lastly, it’s been interesting to watch your company renew and recycle itself to stay on top and ahead in the competitive market that is the yarn industry. So I’ll be quite interested in trying Remix. Kudos to you! I’m very happy to see a market leader like Berroco jump on the green bandwagon. I look for more natural dyes and opportunities for reuse as well as prioritizing in favour of yarns manufactured closer to home as much as possible. And I’m all about reuse and repurposing – felting thrift store finds and handmedowns, and making pillows out of worn out sweaters. I also teach Girl Guides to knit and felt with unwanted yarn and leftovers donated by helpful friends. I haven’t used any “green” yarns yet, but I like the concept. Remix especially sounds interesting to try. I have repurposed projects, but I find that it can be a lot of work and the “new” garment may not be worth the trouble….I like the green yarn concept better! I love the idea of green knitting and look forward to giving Remix a try! I have a few sweaters I’ve considered recycling, but haven’t tried it yet..
Wow I hadn’t heard about Remix – sounds great. I’ve knit bibs and baby sweaters with recycled cotton and really enjoyed it. I’d love to try out the Remix. Your sweater is lovely – like the buttons! I am currently knitting a sweater with recycled yarn from two cashmere sweaters, and loving it! Really looking forward to trying Remix – seems amazing! I’ve knit with frogged yarn and recycled t-shirts, and I’m currently knitting a scarf with recycled yarn. I love it! I’m looking forward to trying Remix for a sweater for my husband. He’s allergic to wool, so this would be just the thing for a mid-season sweater. He has suddenly gotten the idea he needs a cardigan. Hmmm. I LOVE unraveling thrift store sweaters and re purposing (and sometimes redyeing) the yarn. Un raveling is so liberating, usually ripping out causes me stress when I’m the one who knit the stitches. I haven’t tried any “green” yarns but I’d like to! I’ve had mixed results with both recycled yarns and upcycling old garments, but I did snag some frogged cashmere once that I’m just dying to knit with. I’m very intrigued about the mix in Remix, and I love that it looks tweedy and rustic! The sweater is beautiful, and Remix is a very intriguing mixture of fibers. Of course I would love to run it through my fingers. Right now I am working with a “green yarn” made by a competitor (it has “eco” in its title”, and I really like it. I’ve also been known to frog projects and reuse the yarn. I haven’t knit with a yarn made from recycled fibers – yet. I’m sure that greener yarn will become a more frequent choice for future projects. I’m very happy to have more choices! 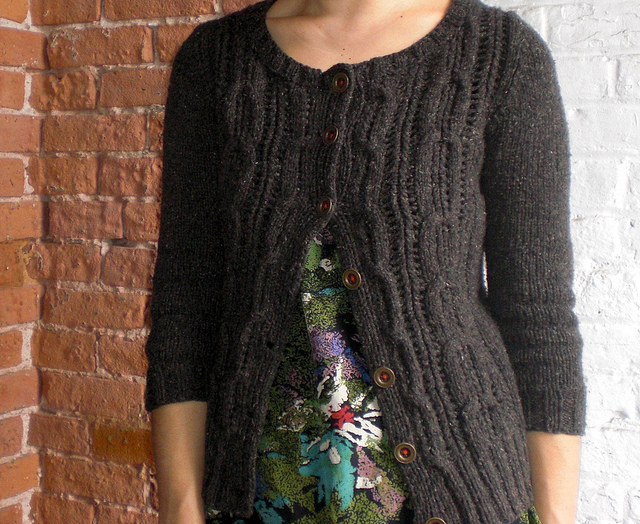 Your Acer Cardigan looks wonderful in “Bittersweet” Remix! I only recently have begun to feel comfortable knitting sweaters, but now I’m completely hooked and it seems like sweaters are what I really want to knit this fall :). I haven’t tried “green” yarns, but “knitting green” sounds like a great idea. I HAVE frogged a thrift store sweater in hopes of knitting a recycled sweater with the rewound yarn someday. I’ve also been riding my bike more and more and supporting local and organic food producers when I can. The environment is very important to me. so green yarn? Yeah, bring it! Cute sweater!! I like the concept of greening yarn; however, since live in Texas I like blends and cooler fibers, so this can be hard to find. Giveaways will always tempt this lurker !! I’ve used recycled Sari yarn, also unraveled nice sweaters from Thrift stores, dyed & reused the yarn . 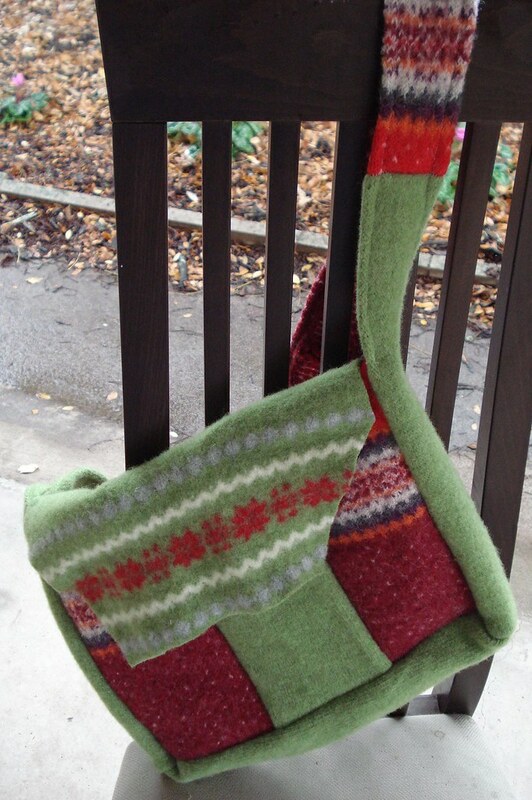 I also felt & make bags from the not so special wool sweaters. I hope it’ll be in a LYS to feel & try it out. I love the red thread on the buttons – I’m totally going to steal, ahem I mean re-use, that idea. I’ve used recycled cotton yarn and liked the marled look it had. I’ve also used organic cotton. I haven’t had a lot of luck using yarn from sweaters at thrift stores. When I see some bloggers dying cashmere yarn from a sweater they thrifted, I think where do they live that they find cashmere at the thrift store? That wasn’t machine knit with cut yarn at the seams? Remix has definitely caught my eye because I really can’t wear wool inside — i get too hot. But I love the look of a wooly, tweedy yarn. I haven’t tried any green yarns yet, though the abundance of them in the past couple of years–which is awesome–is tempting me. And just moving to Seattle where there are fantastic thrift stores means that repurposing a thrift store sweater is on my list this winter. Your sweater turned out beautifully! I have friends that haunt thrift stores and then spend hours and hours picking apart and unravelry sweaters, reskeining and washing the yarn. I’m afraid I’m lazy, but I love the idea of a commercial venture reclaiming yarn. I’d love to try it. I’m so glad sweater weather is here again! That is a beautiful sweater! My greenest yarn is a handspun, local romney from the next town over carded and cleaned on the farm and handspun by me. I tried to recycle a cashmere sweater, but was unable to free the yarn. Instead, since it’s thin enough, I want to sew mitten liners out of it for a pair of superwarm mittens. Go green! I would love to knit this sweater & use Remix. Even if I don’t win, I think I’ll make it anyway. I’ve used Caron Eco yarns before, made from recycled plastic and saving up a stash of plastic grocery bags to make a shopping tote. I haven’t tried a ‘green’ yarn yet but I would love to win the kit! Both your projects look gorgeous! I am a very tactile yarn-buyer, and where I live we haven’t had a lot of “green” yarns appearing in our stores. But coming from a family of die-hard tree huggers, I am all for it! Great sweater – thanks for the contest! I’ve knit with corn and bamboo, and have an alpaca sweater that I think will unravel nicely – just need need to get in there & try it, I guess. I’ve also been knitting a ton from stash – that’s greener than buying new, right? I try to be as green as possible with my yarn choice and use a lot of organic cotton and wool, but I haven’t tried any of the recycled yarns yet. Oh hang on, I tried some recycled sari yarn once but couldn’t figure out what to do with it. Some bits were way thinner than others and it biased terribly. I’d love to try Rowan’s Revive yarn but it’s a wee bit expensive. One of my friend has used Remix though and she really likes it. I also really admire the recycled tshirts etc they have at Muji – have you seen those? Love your Acer cardigan, I really want to make one now! I didn’t like it so much when I saw it on Rav. And I love anything tweedy. I haven’t used any environmentally friendly yarns. After listening to a yarn dyer discuss this issue, I realized I didn’t know enough about the whole process to judge when yarns were actually “friendly” if they had been dyed. I have also not recycled any yarn. Yard sales are way too time consuming. These days we call going green “sustainability” in the corporate world — I’ve been aiming for “sustainability” for years now! Love the new Remix — and really love that cardigan! I’ve purchased some cashmere sweaters at resale shops — but ended up LOVING the sweaters and can’t (at least for the moment!) bring myself to unknit them. At some point, however, that will be their fate — maybe when they don’t fit anymore? Thanks for Remix! I’ve never had any success unraveling sweaters from thrift stores and I worry a bit that the yarn would be too thin. I have used several yarns that are quietly eco: locally spun wool from a family farm, alpaca straight from the farm, naturally colored cotton. I’d be interested in trying the Remix. I love the idea of eco-friendly knitting, but in reality, the sweater I’m recycling is so well-finished that picking it apart is more painstaking than I expected. I really want to knit with Silky Tweed, though, so I’m going to finish it! I would LOVE the kit! The pattern is beautiful & the yarn gorgoeous! What a fun knit! 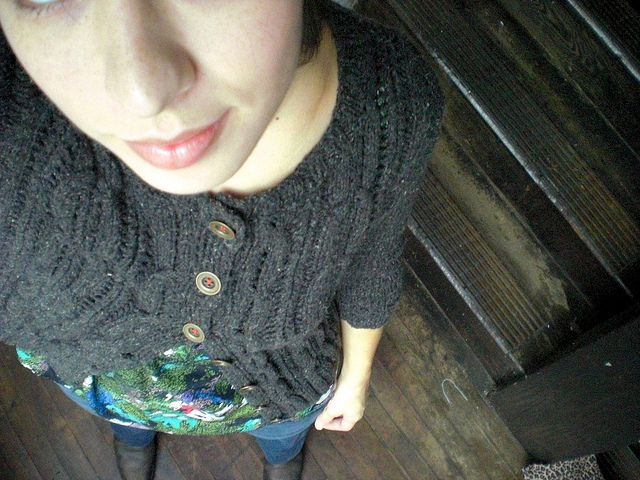 I LOVE this sweater, especially done with 3/4 sleeves… your mods are perfect! This yarn sounds great, perfect for that transitional time of the year. I love that it doesn’t have wool in it, but that it looks tweedy and textural. Berroco is always at the forefront with yarns and design… this yarn and it’s pattern support is a perfect example! I haven’t yet found any sweaters I want to recycle as I’m trying to burn through my stash, but am very interested in recycled yarn. I love the styling of that sweater and the yarn is great. I want 3/4 sleeves on everything I knit these days. So much more practical for anything I wear to work. I remember when you were knitting a pair of sweatpants many years ago. I should have known you would become a designer and stylist back then! Ha!! Those would have been flattering, hunh? Hope everything is good with you–Adam has made quite the name for himself too! I think it’s a wonderful idea to recycle yarn from old sweaters. I think everyone has that old favorite sweater that may be beyond repair. To think that you can take that “old” favorite and turn it into a “new” favorite is so welcoming. I wished that I started knitting a long time ago. I remember an old and battered green tweed cable cardigan that I had from my college days that I donated to goodwill! Your sweater looks great and the hat too. You are so inspiring. In this day and age, doing anything “green” is by far the way to go. While I have yet to deconstruct a sweater for the yarn, I do have a growing pile of store bought or knitting disasters to rip and give new life to. Being a spinner as well, I also enjoy spinning local fibers. Just the thought of spinning and then knitting an item and being able to see the animal the wool came from brings joy. I just saw some remix yesterday at my LYS. I couldn’t spend much time with it since I was hunting yarn for a customer. I loved the feel and think I will be making EZ rib warmer as a transition piece for this fall. I haven’t done much with recycling yarn or reclaiming yarn from old knits. I do a lot of recycling of clothing by turning the old to something new. So excited to try Remix. It looks awesome! I so love this cardi pattern, how sweet! Knitting green? I’m really not there yet although I am very concerned about all the products I use in my home and on and in my body and that of my family. I would love to have this wonderful gift so that you can start me on my way to Green Knitting! I love that cardi – Acer has been in my Ravelry queue for a long time – great to see it made up in Remix. Any chance we’ll see a wool version of Remix? I believe a little more attention to the environment, in all aspects of life, is a good idea. In my crafting, I’ve unraveled sweaters to employ the wool for new projects, felted thrift store finds or stuff that didn’t fit me anymore, cut old men’s shirts into child- or doll-sized clothes, AND dug out doilies, fabric scraps, buttons, and even a cute embroidered bag from skips. This sweater just recently found its way into my queue, and I’m very curious about Remix! Love the sweater and what an awesome color! Looks nice and snuggly without being too hot. Haven’t tried eco-friendly yarns yet, but if they knit up as beautifully as your sweater obviously has — I’m in! Thanks for offer! That sweater looks so comfy. Its cool here this morning, so I wish I had it to wear to work today. I have a sweater that I am thinking of repurposing the yarn. The yarn is in good shape, the sweater itself isn’t. I’m happy to see Berroco stepping into the green movement. I love to reuse old yarns. My fav was a wool cardigan my grandmother had bought in Scotland. This sweater from ‘the old country’ was precious to her but by the time it made it to me it was full of holes. I pulled it apart and I’m still using the wool. The mittens were the best! I’m looking forward to trying out remix. I do recycle yarn – I started “greening” old sweaters about 8 or 9 years ago. You’ve intrigued me to try this yarn. I love your sweater, very cute (good choice with the buttons!). Anything that feels like a soft t-shirt is a must-try! I’ve had success unraveling an old cashmere blend sweater picked up from Goodwill. I’ve also enjoyed working with the Solstice yarn from Classic Elite. I’m such a fan of wool my fiber selection rarely strays from the flock. To keep it green I love discovering local yarnies and sampling their handspun. I’m considering joining one of those yarn CSAs soon too… Maybe put it on my Christmas wish list? Berroco Remix sounds like the perfect choice for me to explore plant-based and recycled fibers! What a lovely way to start off the day – thinking about the possibilities for this yarn. I haven’t tried any ‘green’ yarns yet, but love the look of this, and now want to feel it. Thanks for sharing pictures and your thoughts in putting this sweater all together. Thank you for the interesting blog re: Remix. I am going to seek it out and try it! I like your description of the way that it feels — that was the tipping point in my mind! I have not tried the green yarns yet, but I am looking forward to it. I have, however, felted old sweaters and then made things like hats, mittens, and scarves out of them. Happy knitting, and thanks for the give-away :-D.
Very cool. There is always a proper use for fiber. I do have a few yarns that aren’t appropriate for knitting, but look and work up much better in weaving. I have to admit that I’ve been focusing on organic yarns and local yarns as opposed to the wider spectrum of recycled yarns. I’ve been looking for Remix for the last 2-3 weeks at my local yarn shops. I have hopes of seeing it soon! I just favorited the Acer Cardigan. It is so cute. I love the eco part of the yarn. However, I also like that it is wool-free. I live way below the Mason Dixon and I can only wear wool 2 or 3 months. I’ve tried Berroco Remix and I absolutely love it. Your sweater and hat both look terrific (I’m seriously considering making that hat!). I’m so happy to see Berroco put out a green yarn. The smallest things can make a big difference. I love this sweater. I am waiting for my yarn store to get Remix in so that I can start a dress for my 5 year old granddaughter. Not only do I love that this is a recycled yarn but also I love that it is machine washable – great for children. I also think the hat is great. interesting… as a natural fibers enthousiast, I’d really like to see if this yarn is really as great as everyone says!!! I have always liked the idea of being green and sustainability, yarn made out of clothing that has been recycled sounds great and especially in that tweedy texture! Sweater is so cute on you Cirilia, perfect for those Fall days. I was already looking forward to making it down to my LYS to check out (machine washable! recycled!) Remix, but Acer may be the impulse that finally gets me there. Thanks! Well, I’ve gotten as far as unraveling the yarn from a heavily cabled alpaca sweater, but I haven’t knit anything with it yet. Yarn is in the stash! Beautiful sweater and I’d love to knit one. That sweater is gorgeous! I love the tweedy look of the remix yarn. I’ve yet to use yarn from on old swetaer but used recycled yarn for an afghan and it worked up quite nicely. I’d love to try berroco’s version for that sweater. I love your sweater, yuo did a great job. And what a wonderful big sister you are to knit you and your younger sister matching hats. I have reclaimed yarn from sweaters. I have done this several times and really like the idea that the item is not going to waste. I have yet to purchase recycled yarn, seemed kind of funny to buy it when you can “make” it. Oooh, I’ve got to try for a chance at this. Lovely sweater and I love your final choice of buttons and red thread to sew them on with. I love that sweater! I haven’t used any recycled fibers, though I did order some Remix yesterday, but my knitting is lacking some environmental friendliness. I’m trying to use non-superwash when possible, but that’s hard sometimes! I have always liked the idea of being green and sustainability, yarn made out of clothing that has been recycled sounds great and especially in that great texture! Sweater is so cute on you Cirilia, perfect for those Fall days. I haven’t done any yarn recycling, but love the idea of repurposing fiber. This yarn looks like a really yummy and cozy fiber mix. I really like the way it looks in the Acer cardigan, and would like to try it for a casual sweater to wear this winter. Great hat and sweater! Thanks for the free offer. I love finding old sweaters at thrift stores and unraveling them to reuse the yarn. The whole thing is therapeutic to me from undoing the seams to winding the yarn to making new lovely yarn cakes. The sweater looks great! I do try to green my knitting by buying local yarns. I have not seen recycled yarn a my local yarn stores, but would love to try it. Thanks for the chance to win. I have for a long time trended towards local wool or yarns, which can be easy to do in VT. I saw some of the Remix in the yarn store the other day and was intrigued about how the yarn was recycled. It would be great to try for a summer sweater or just for a change of yarn type. Thanks again for the great yarn choices! hello! i’m a beginner knitter, but i’m currently using remix for a little drawstring bag. loved the remix pattern book and video. and your sweater is perfect. thanks for chance to win! I’m so thrilled about Berroco’s new yarn! I had the opportunity to try lots of “green” and recycled yarns as part of the designing for my book, “Knit Green.” It is exciting to see more and more yarn companies and knitters thinking about green issues in their knitting…way to go! I can’t wait to see Remix in my LYS! And I just love that Acer pattern — I’ve added it to my queue on Ravelry. Oh, that looks lovely! So nice to see a cabled cardigan that doesn’t look too bulky. I also love to follow your work, your writing and inspired creativity! This sweater is wonderful and I love hearing about your process. I am a creative needle arts inthusiast, voraious knitter and soapmaker. Your work is accessible and follows your art which in turn follows life….I love your talent! Kepp me in consideration for your kit please! You are so talented! Cirilia – I think knitters are in the green mind anyway because the craft just lends itself to reknitting naturally. My neighbor gave me a half-finished sweater that the moths had gotten to so I tore it apart and was able to get enough yardage to make a kids-sized pair of socks. Thanks for the giveaway. I love recycling ALL things!! My damaged sweaters have become colorful pillow covers around the house and mittens! I am anxious to try this new yarn. Love the little detail about using red thread on the metal buttons…such punch! The recycled fibers I have seen have been kind of funky so I decided not to try them. This lead me to be dubious regarding remix. However, I was in a new yarn shop in Dallas, Holly’s Yarns off Preston, and saw remix. Boy did that change my mind! And then this blog this week with an incredible offer! Here’s hoping the stars line up in my direction. I have kept myself at the beginner stage of knitting for a while now and so I am ready to take the next step past hats and baby blankets to doing a cardigen. It would feel great to use a recycled yarn too. Another question: do you consider yarns that are made out of different stuff like milk fibers, etc. to be green? I know that some of these yarns are taking the cast off from other processes to make yarn while some are not. This morning, before I read your blog post, I was doing an internet search to see if there was a yarn store close to me that carried Remix yet. Sadly not. Our daughter-in-law has inspired me to become more green minded. When her baby was born in March, I enjoyed knitting burp cloths for him out of recycled cotton. I was very excited when I heard about Remix and hope I can get some soon. I definitely have green yarns in my stash; I like buying from small independent yarn producers, and natural dyes result in such lovely colours! I think environmental footprint is an important consideration, but it’s harder to shop green now that it’s become a buzz word; not all “green” products live up to their label. I love the idea of greening up my yarn…although I think that knitters are pretty green themselves by making their own garments and not relying on a machine to do it for them. I can’t wait to try out the new yarn! I love the idea that remix is totally washable and unlikely to change once constructed. I have had many disappointments with other yarns that look best the first time they’re blocked and it’s all downhill from there. Also nice to be able to gift an item without complicated washing instructions. Some of my young female relations just wouldn’t bother, so the item would go unused. The sweater looks beautiful and I love the tweediness of the yarn. I haven’t knit with recycled yarn yet, but I’d love to try. I’ve been making an effort to knit with only organic yarns lately but repurposing yarn from other projects is a great idea too. Thanks for offering a kit and happy knitting! Wow, your sweater looks great! I have tried using yarn from thrift store sweaters and while I found it kind of time consuming I did really love some of the yarn I got from it. I just have to learn to be more discerning when picking sweaters so that I will end up with something worth the effort. It’s a lovely sweater and I’d love to try it out. I’ve recycled any number of sweaters made with ‘rich’ yarns I can’t afford (100% camel or cashmere, for example). I now have more luxury yarn than I’ll ever be able to use! Still, nothing quite beats Ultra Alpaca – I just whipped up a pair of socks with it this week for a friend w/cancer. Sooo soft and delish! Love the yarn! I’ve re-used yarn from outdated sweaters, re-used baling twine, and have knit with fabric strips. It’s fun to see how you can turn something old into an unexpected new surprise. The cardi looks lovely on you – thanks for offering the chance to win the Remix yarn and Acer pattern! I have formulated several green tactics: knit from stash yarn, use organic cotton, buy only regional minimally processed yarn. I’m failing miserably so far. But I’ll keep trying. I love the Acer sweater. It is in my queue on Ravelry. I have two rubbermaid boxes of yarn that was in my Grandmother’s attic. (I have already used one box of it.) I am working on making myself one sweater of each color. I have also used yarns that I got from Freecycle to make some beautiful items. Remix is gorgeous and a great ‘warm’ yarn when wool can’t be used. The Acer sweater looks awesome and I would love to make it. I haven’t tried ‘green’ yarns but have recycled sweaters by unravelling and re-using yarn, or felting and cutting up to sew something. I love working green. I have de-construvted many sweaters to make other items. I have an old wool sweater in the washer right now on its way to being felted so I can make a bag for me to carry my knitting around in. I think it will turn out great, it has lots of color. I can’t wait to try this yarn it looks nice and I love soft yarn. I am also a big fan of working with plarn and tarn. I love the idea of Remix and can’t wait to try it out! I do like the idea of reusing fiber & yarns. I’m more likely to cut apart an old sweater than sew it into something but I do have a ribbon sweater that I’m unwinding just for the yarn. I agree with many of the commenters above that many green yarns don’t have green processing and actually are as damaging as synthetics, although I do like that the original source was natural and renewable. Now I’m waiting for Remix Fine! It’d be great to have something that was recycled, strong and finer for more delicate knitting & crochet. Recycle seems to mean thick and chunky to so many people. Working in the environmental field, the idea of using green yarn appeals to me. I have used some bamboo blend yarns & some organic cotton, I’d like to give Remix a try, especially since it’s got some great earthy tones. I really like the idea of recycled yarns but up to now I have not made anything from these products. However now that I’ve read about Remix I just may give it a try. Love the cardigan! The “Remix” sounds wonderful and the cable sweater is cozy. Both are on my “To Do” list, right under find more time. Thanks for sharing. your sweater looks terrific! Knitting green? Yes, I’m not a zealot, but for most projects — preferring browns and grays (i’m the queen of B&G! ), I lean toward the less-processed yarns, wool or otherwise. Am stash-building with some of the yarns made with recycled fibers. I’ve always been a thrifty sort, but sometimes being green isn’t quite the same as being thrifty. I’ve tried unraveling old sweaters from Goodwill, but often the yarn you get isn’t as nice as you’d hoped it would be before you unraveled. I love that you have a yarn that does the recycling for us! Remix looks great, and what an innovative approach to “eco-fashion”! I’ve made several “green” sweaters by reusing wool from unraveled thrift store sweaters, and am looking forward to trying Remix as another eco-friendly option. I’ve never tried a recycled yarn, but I look forward to trying one. It’s like the polartec of the knitting world. I also appreciate that Remix is machine washable. Just in my experience, Berrocco yarns are a good value. Acer looks like a great pattern! both those projects came out ace! when i first got into quilting it was interesting to learn of the batting made from recycled water and pop bottles. great to see a yarn line going in the same direction 🙂 love to give it a try! I try to pick-up sweaters from Goodwill that can be frogged and the yarn reused. I’m chaining together scraps from quilt pieces to knit. I use a lot of local fleeces. So I consider that also being environmentally conscience. I haven’t found a recycled yarn I like yet. I hope I get this kit as the first! Remix is intriguing, I would love to try it. Green knitting is great. I would love to see a greater demand for used clothing, linens etc. that can no longer be used as such. I have enough “cleaning rags” to last a lifetime because I don’t know what else to do with unwanted textiles. I found a cashmere sweater at Goodwill and was able to recycle the yarn… what fun I had! I haven’t tried any other green/eco yarns yet but have done a lot of recycling in my quilting and fabric projects. The only sweater I’ve ever raveled was one that I made. It didn’t fit right and wasn’t flattering, so I pulled it all out. The yarn has not as yet made anything else, but it is really beautiful. I love the look of this sweater in the Remix. I’d like to win, please. I’ve never used a “green” yarn, but have definitely recycled some sweaters for new uses. I would love to get my hands on some Remix. I haven’t recycled any yarn yet, afraid of the quality of the yarn I would get by unravelling a garment. So I think that producing yarn using recycled fiber is a great idea, as it can be eco-friendly while assuring good quality to the final product (the yarn). Where does the fiber you use to produce this yarn come from? Seeing how nice the gardigan looks like makes me want to try it! This stuff looks great! Just got the newsletter email about this yarn and even before I knew it was recycled, I love the texture and the tweedy look it has. I have never tried recycling an old sweater – I am too impatient for all of that unraveling and washing and reskeining. I think its great to make ‘green’ yarn! I’ve only recycled an old cardigan. It was a great experience to make something old and not really worn into something new and wonderful. I just bought some of this Remix yarn and made a swatch. I absolutely love the hand and stitch definition. I am going to make a hooded scarf for my niece. Please keep more yarns like this one coming. For those of us who can’t wear wool, it gives us more options. I know my niece will appreciate knowing I knit her scarf with recycled yarn, too! I love the steam punk buttons! I loved the look of this yarn before I found out what it was made from-then I loved it even more! I will definitely be trying this yarn, since there are so many people in my life who won’t wear animal fiber. I really like the look of this sweater, too. Thanks for running a giveaway! That hat is fabulous. I’ve got to make one! I’ve used recycled cottons before. They’re pretty wonderful for dishcloths or other small things that you want feeling soft. I even turned an old cotton sweater into the cutest teddy bear. Sheets are another fun thing to rip apart and reuse. I’ve crocheted rugs and bags out of them – especially the really soft flannel ones. Haven’t tried any green yarns as yet, to be honest I haven’t seen any for purchase in NZ. I do recycle sweaters though, unravel, skein, wash, wind. Takes a bit of time but produces perfectly good garments at the end. Nice to say things like “this used to be jumper of my fathers” – garment with history and stories. The Remix looks great, lovely colours. I haven’t tried any green yarns yet but Remix sounds like a great yarn to start with. I have recycled yarn. The next on my list to recycle is one of the first sweaters I made. It is a mock turtle neck made out of Lopi. It is soooo warm that I can never wear it indoors, so I plan to recycle it into felted kitty beds. I also have some fun fur in my stash which I will use along the top rows and I will make one for each of my kitties for Christmas! I like the cardigan. It looks comfy and classic. I haven’t tried recycled yarns yet. I have seen a few around and have been tempted. I’ll definetly have to give recycled yarns a try. Nice hat, and I love the sweater! Several months ago I went out and bought an armful of thrift store sweaters with the intention of unraveling them and reusing the yarn, but then I started a new job and ran out of time. They’re still in a pile in my spare room, staring me down! I am allergic to wool, so I’m always looking for alternatives. The problem with acrylics is they are not so soft and colors are never as nice as wool colors. Cotton is good but is often heavy and takes a long time to dry. Remix seems a perfect solution for me. I like the tweedy look. I have recycled yarn from old sweaters. I like to mix different yarns too for a unique look. I have renovated old sweaters by reknitting sleeves in different colors or with stripes. I also make vests from cardigans. Cute hat, love the sweater, the red yarn makes the whole thing so funky and so YOU! I have yet to see Remix in person, but I am in love with the concept! That remix yarn sounds great! I’ve tried a few “green” yarns. Some farm/small mill/undyed or natural dyed type yarns as well as the recycled sari silk and a couple of recycled sweaters. I love trying new yarn! This yarn reminds me of the story in Annemor Sundbo’s book, about a factory in Norway for “recycling” old woolens into pillow stuffing and other such products. Those Norwegians were thrifty! I’ve tried a couple of the DIY “green” yarn solutions: reclaiming thrift store finds, making tshirt or fabric yarns, even tried “plarn”. I’m happy to see a commercial option, and even though that means a bit more fuel/emissions to reprocess the yarn, at least all those yarns, garments, and samples from the ready-to-wear industry aren’t getting put into a landfill. Kudos to Berocco for offering a recycled yarn, and what a bonus that it’s soft and beautiful! I haven’t tried any of the “green” yarns yet, but I read up on Remix this morning when I got an email from Berroco–although I don’t need more yarn, I would love to try this new product. I’m excited to see more and more environmental friendly products on the market and the trend for people to become more green in their lives. I’m also curious about your comments about it being cooler to wear in the summer–rather than wool. Living in Texas makes it a real challenge to knit and/or wear knits in the summer because of the extreme heat. Great sweater! I would love to hear more about your “one-row” buttonholes! Hmmmm…..does frogging & starting over count as recycling???? I’ve used ecology minded cotton that I’ve loved-very soft. And wouldn’t I love to have a new yarn (and a new sweater!) to add to my stash! I’ve read such good things about Remix, can’t wait to try some. The sweater looks great and I would love to win the kit!! Thanks for the giveaway! Wow! Beautiful cardi & yummy looking yarn. My green efforts have been recycling sweaters and mostly using buttons from my great grandmother’s button tin that I inherited. I love the idea of taking the mill ends and making something new from it. I made “Hey Teach” from Second Time Cotton. It is sooo comfortable. Definitely would use green yarns again. What a beautiful sweater, it is gorgous!! Nice work! I like how the button thread is that lovely tomoato red. I love the cardigan and am excited to try Remix. Have been meaning to get old sweaters and recycle them…but I barely have enough time just to knit! I’m really pleased with the movement towards more sustainably-produced yarns. But, of course, to be really green in our yarn choices we need to buy only what we love and know for sure we’ll use. I need to work on that one! The shorter sleeves, scoop neck, and the buttons with the red yarn, really give the sweater a current look–very attractive! i still recycle old sweaters and sometimes sweaters bought in thrift stores when i like the colour or texture of the yarn. i have not bought any recycled yarn but made my own by cutting up old t-shirts into stripes to knit a floor mat for the bathroom. i would love to get this kit – cos i like the pattern. Oh–I love to use organic or minimally processes yarns for baby things. It just seems like the right thing to use. I would love to try out REMIX in this cardigan pattern. Have knit with many strange things including plastic bags, plastic tablecoths, and various types of fabric. Have been recycling since long before it bacame popular. Hope I win!!! I’ve eyed the Remix, but haven’t bought any yet. Looks great! Bummed that I am too late to participate in the contest, but that is one lovely sweater! Green yarns make me feel a lot better – already there is all that energy used just to get them to me, so it definitely feels good if they were created without a lot of chemical pesticides/herbicides/antibiotics or whatever – would rather tread lightly on the earth since it’s the only one we have! Although I have tried the recycled cotton from Lion Brand and liked it a lot, at this point I think the most ecologically sound thing I can do right now is knit from stash, since the yarn I buy has to be shipped and trucked from place to place. I’m also interested in buying local yarn–there’s some wonderful stuff at the farmer’s market that comes to town with the lamb and other products from a farm upstate. I think green yarns are terrific, but there is more than one way to be green. Remix looks terrific, by the way and especially good for kids wear! I have several skeins of an organic cotton that I plan to make a sweater for my grandson—my son & wife are extremely ecologically conscious. I made an organic cotton baby afghan and loved the feel of the yarn. The Acer Cardigan is classic but modern at the same time….like it! This new yarn looks awesome! Hope I win…. Lately I’ve been collecting wool sweaters , felting them, cutting apart the “fabric” and making other things out of it. What a gorgeous cardigan – and a lovely looking yarn! I always change my mind about buttons too: sometimes I think they’re the trickiest part of making a cardigan. I love the idea of the recycling as well as the look of the new Remix. I haven’t recycled yarn from sweaters (besides “frogging”) but have often reused buttons from no longer wearable garments. Love the Acer Cardigan too! I’m intrigued by the concept and will definitely try the yarn. (I don’t usually work with acrylic, but the combination of many fibers, like a mutt from the shelter, might have each fiber compensating for the drawbacks of the other and make a fine yarn overall. I have not yet tried any specifically green yarns yet, but would love to give one a try!! Thanks for running this contest! Love the cardi & the yarn. My recycling to date consists of frogging and repurposing. Remix looks beautiful, such gorgeous colours! I’ll be looking for it in my LYS. Haven’t used any ‘green’ yarns yet, but do recycle old sweaters (my own as well as thrift store finds) the usual ways by unravelling and reusing the yarn, or felting and cutting them up to sew into things. If the pattern still looks great, but the style is wrong (dropped sleeve sweaters are the best) I cut off the sleeves, sew up the sides and top to make a rectangle, then make some kind of closing on the bottom; zipper, buttons (often recyled as well) or I just leave it open, to make a fast and gorgeous cushion cover. Why not go green if we can? Knitting in and of itself is green, and if I can get great yarn with less of an impact on the planet–sounds all good to me. I love this cardigan! Very cool that you’re making recycled yarn now. An excellent option, and hope other manufacturers follow your lead. I haven’t yet tried recycled yarn, but I’m SO EXCITED to try Remix! Everything I’ve read about it so far just sounds perfect. My personal greening in my knitting is 1)frogging old projects and reusing the yarn, and 2) teaching the kids I knit with so use their scraps for all kinds of things! Trimmings can stuff pillows, and small balls can be a random stripe here and there. I hope I win! I think Greening is all well and good if it makes you happy and even more so if it actually works (read: the yarn must save more energy than it consumes in its creation process). What I dig MORE about Remix is that it now makes tweed accessible to people like me who couldn’t wear it before due to an animal fiber sensitivity. Hooray for no-wool tweed! Love, love, love the gorgeous cardigan…love the color, the fit, the stitching…I’ve been using recycled bamboo and silk blends for knitting lately – beautiful texture and knits up very nicely! I have been excited to try this yarn since the raves started appearing on the Berroco site. I gravitate toward recycled cottons, and I’m big on upcycled t-shirt yarn. Love it when yarn goes green! Donna, can you tell me more about upcycled t-shirt yarn?? A beautiful sweater!! Haven’t tried any green yarns yet but have been sticking to my stash so far. Would live this addition! cute sweater! I find that I have trouble unravelling sweaters but have had some other kinds of recycling luck — I felted a boxy cashmere sweater, then cut off the sleeves (cozy armwarmers) and then sliced directly up the center front for a short sleeved cashmere bolero– and the felted ribbing makes a slight ruffle! it was so cool. I’m pleased to see more green yarns and more recycled content in yarn! I haven’t recycled sweaters but I am currently knitting a project with Rowan’s Revive, which is recycled and I think has a similar fiber content to Remix only is a thinner yarn. I am hoping to try Remix very soon! I had been wondering about this yarn. I love its tweedy look and hope it is start of a recycled trend. I love the concept of creating new yarns from old clothes. I’ve been very impressed with these types of yarns I’ve seen so far. I’ve torn apart and reused a few of my knitted failures, and I helped a friend find a new use for some absolutely beautiful sweaters her mother had knit in amazing patterns. The colors and patterns were incredible, but the styles were boxy and outdated. So, I introduced her to felting and we are trying to make some bags with some of the resulting material. I love your cardigan, and am looking forward to seeing Remix in my LYSs, and thanks for the contest opportunity! I haven’t tried any “green” yarns yet – mostly sticking to my stash at the moment. In fact the last sweater I knit was with yarn recycled from a previously-knitted sweater that didn’t turn out to be flattering, so I frogged it, reskeined and washed the yarn, and came up with a new pattern for it that worked much better. I did love the look and feel of Remix when I saw it in my LYS recently. And Acer looks like a perfect pattern idea! I like the idea of recycled yarn but much depends on the feel and colors of the product. And I just don’t get why anyone would want recycled acrylic. It doesn’t get better just because one recycles it, right? Remix sounds great, can’t wait to find it in a yarn store and see how it feels. I do wish it had less nylon and ackrylic, though. First let me say – I love the hat! I try to “green” my knitting by using animal fiber yarns, since they are renewable. I’ve never tried recycled yarn, but I love the looks of this one! Would love to have this kit. The cardigan looks like a great challenge knit and yours is beautiful. Oh, I love that sweater!! My only recycling type of effort thus far has been to use yarn I have here rather than buying new, whenever possible. And I did just order some Remix for my woolophobe husband’s Christmas sweater. I’m looking forward to that. P.S. Why does your blog come up as (title unknown) in google Reader? I absolutely love Remix, and that cardigan is fantastic. I haven’t done much with green yarn, though I think being able to reuse items in processing is great. It really come down to whether a yarn is a wonderful yarn, and how the price point matches what I need. I have begun to think more about greening my yarn, but with mixed results. I knit house slippers with Caron Simply Soft Eco which tore up my fingers while knitting (very glad it was a quick knit!) And I knit a sweater with 2nd time cotton and loved it. I’m very eager to try Remix since I’ve heard good reports about it. Thanks for the offer to win this beautiful pattern and yarn! I HAD to comment because I’d love to win it! I have recycled yarn from another sweater but haven’t used purchased recycled yarn and would enjoy the opportunity to work with it. I have a button box handed down from my mother, but if I can’t find a match there, I have an on-line source that sells vintage buttons. Was happy to hear you have trial and error with your button choices too, but love the end result! Happy knitting! Love your sweater! Like most, I would prefer to only use organic yarns, but the price tag, is usually quite high. Also, I’ve noticed in the last year or so, that I’m beginning to prefer “woolier” yarns — as opposed to always going for the softest yarns I could afford. It was Cascade Eco, bought for a knit-a-long that showed me how much fun those kinds of yarns can be. I bought a couple cashmere sweaters cheap at a thrift store a while ago, but I still haven’t worked up the courage to unravel them. I like the idea of a recycled yarn with so many fibers combined! Silk & linen are my two favorite fibers, so it’s nice to see them in this yarn. I love the idea of green knitting! I’ve worked with recycled sari silk yarn and recycled cotton yarn from Knit One Crochet Too. The sari silk yarn comes in the most amazing vibrant colors. The recycled cotton yarn is much nicer than I expected. The multi colors work up to a cool tweed like effect and the fabric is really durable. I read about great way to reuse old wool sweaters in Eco Craft: Recycle Recraft Restyle. You cut the sweaters into thick strips, knit the strips into a rug, then felt. The finished rug was really pretty and I love that it can be machine washed and dried. The sweater is gorgeous and I especially like the detail of red thread to sew on the buttons, now why didn’t I think of that?! A little peek of contrast for interest. Seeing your Acer may have pushed me over the edge to knit my own. Its so cute on you! I don’t think I’ve ever tried recycled yarn, but I’d love to try this one. I would love to knit ACER – looks like a great design, lovely yarn and cardigans are my favorite. I grew up in an era where reusing, repurposing and recycling were the norm and before anything but leaves were known as ‘green’. My dad died this summer and for the past 2 years he has wound all my skeins into balls for me. Not long before he died he said to me, do you have any old sweaters you want taken apart and wound into balls? I’d really love to do that. So ever since childhood, I’m always making something new from something old and some things even turn out better that way. People who have married into my family either have similar philosophies or they are contagious, I don’t know which. Not long ago I received as a gift a beautiful beaded, felted tea cozy which looked strangely familiar. I figured it out – I once had a lovely warm woolen sweater which I had worn during my last couple of pregnancies. I had handed down to my sister-in-law when she was pregnant. 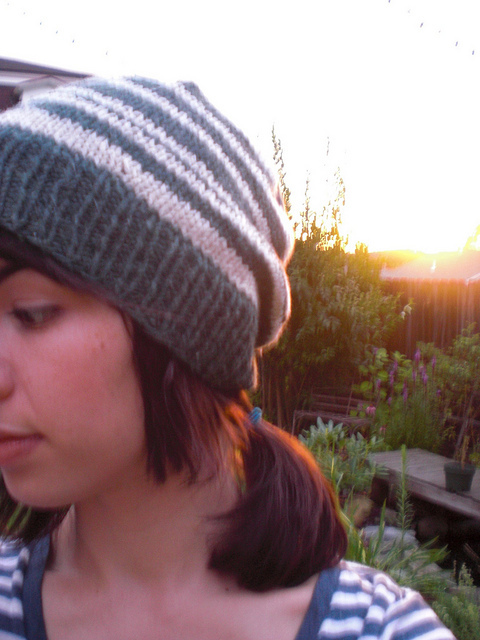 A few years later I got it back in the form of a tea-cozy. I love it and the memories associated with it. Your version of this sweater is lovely! It is especially interesting to see the 3/4 sleeves. I also like your yarn color choice as brown seems to be the predominant color in my stash. As far as knitting green, I have frogged and reused several items!! I have also knit with eco-type wools and one cotton. I was just checking out the Acer sweater on Ravelry. I am all for green yarns and would love to try this yarn and pattern out! Yup, I have recycled wool yarn from thrift store sweaters. It makes me sad to think of all the work put into a sweater to have it end up in a pile at Value Village, bought and unraveled. Then I think about some of the things I have made and given away because by the time they’re done, I can’t stand to look at them anymore. Funny how the process of making something can either make you love or hate it. I loved all the patterns you showed in the video for this yarn. I want to make them all. I think it is a responcible thing to do to reuse (repurpose) what you have. We are way too much a throw away society. I adore this updated classic cardigan….Alas, my matronly chest is too large for the sizing…and I am not clever with adjusting a pattern…This will have to be for my grandaughters…. 😦 … Love 3/4 sleeves! My knitted sleeves are ALWAYS too long!!! This is perfect!! I haven’t recycled an old sweater because I don’t have any! I mostly give my knitted and crocheted items to others. However, when I was in high school I couldn’t afford to by yarn and I had one sweater that I unraveled and reknit several times just for the joy of knitting! Does that count? I haven’t tried any recycled yarns yet because I’m in the same financial state as when I was in high school, but I’m very interested in trying some. I hope I win the sweater kit! To keep my knitting greener, I try to sew and use cloth bags for project bags, rather than plastic bags. I try to buy yarn made from renewable resources (wool, cotton, etc as opposed to acrylic or rayon). And I’m looking forward to getting my hands on some Remix as soon as I find it in person! Beautiful cardigan. Would be a challenge for me. I have tried knitting with Bamboo and loved it. That’s about all the green knitting that I have done. Lovely sweater. To answer your question about recycling old sweaters — there is no need for many years as I refuse to stop wearing any of them. I am giving one old wool sweater away to the clothing bank — but it could be made into something else — like a purse or a pair of mittens. I would rather knit a new pair of mittens of the recycled yarn. Making something new from recycled yarn makes one feel like they are doing the green thing. I’ve only felted old sweaters (mostly by accident) and made soakers for friends’ babies out of them. I’m super excited about the Remix, and how to work it into my knitting, and I love the Acer cardi. I’ve been using recycled sweater yarn to knit hats and scarves for people in Boulder whose houses have been burned down this week. Let me know if you’d like to help. This is my first year living in a place with a real winter, so I’m excited about making a sweater or two. I’ve never needed a “transitional” cardigan, but these chilly nights are making Acer look even better. I have used a few Eco type wools and cottons. I liked some of them quite a bit. I haven’t recycled any sweaters from thrift stores, though I would if I ever found anything that I’d like to work with. I’ve had my eye on that pattern for a while now, I love your version of it. The recycled yarn looks great and I would love to try some. I hope my LYS gets some in soon! i think being green with your knitting is a great idea. i have gotten yarn from some goodwill sweaters and have used it for charity knitting. i’ve also frogged some of my old projects that weren’t being used into new, usable knits. your acer cardigan is super cute. it’s in my queue. All I want to know about Remix is if it’s too hot with the nylon and acrylic content… it looks great but will my menopausal soul sweat for all eternity? Love all that you do, Cirilia! a beautiful cardigan! I haven’t really done much eco-knitting, I must admit, except for using lots of Blue Sky Alpacas’ Color Dyed Organic Cotton because I love it so much! Previous article New England Knits!